Five world-class winter resorts are perched among the high peaks of the Canadian Rockies. 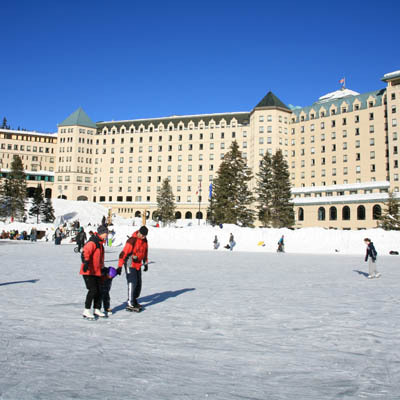 The largest, and Canada’s second largest (only Whistler/Blackcomb is larger), is Lake Louise, overlooking the lake of the same name in Banff National Park. The resort boasts 1,700 hectares (4,200 acres) of skiing and boarding on four distinct faces, with wide-open bowls and runs for all abilities. Banff’s other two resorts are Sunshine Village, sitting on the Continental Divide and accessible only by gondola, and Norquay, a resort with heart-pounding runs overlooking the town of Banff. Kananaskis Country is home to Nakiska, a resort developed especially for the downhill events of the 1988 Winter Olympic Games in Calgary. Marmot Basin, in Jasper National Park, has minimal crowds and a maximum variety of terrain. Across the border in British Columbia, near Golden, Kicking Horse Mountain Resort is a big hill with an even bigger reputation for its challenging terrain, while Panorama appeals to all levels of ability. Winter is low season in the mountains, so many accommodations reduce their rates drastically. Lift and lodging package deals at many resorts start around $100 per person per night. Sunshine Village, Kicking Horse, and Panorama have on-slope lodging, while the other resorts are served by shuttle buses from the nearest towns. Most resorts open in early December and close in May. Commercial helicopter operations are banned in the national parks of the Canadian Rockies, but two surrounding heli-ski operators provide transfers from Banff and Jasper. One such company is R.K. Heli-Ski (250/342-3889 or 800/661-6060, www.rkheliski.com), which is based on the west side of the mountains at Panorama but provides daily transfers from Banff and Lake Louise for a day’s heli-skiing or boarding high in the Purcell Mountains. The cost is $800 to $980 per person. The only other company that offers day trips is Robson Helimagic, based west of Jasper at Valemont (250/566-4700 or 877/454-4700, www.robsonhelimagic.com), which charges $785 for a day’s skiing on the northern boundary of Mount Robson Provincial Park. The town of Banff is headquarters for the world’s largest heli-skiing operation, Canadian Mountain Holidays (403/762-7100 or 800/661-0252, www.cmhski.com), although the skiing and boarding terrain is accessed from 12 upscale lodges scattered throughout eastern British Columbia. Seven-day packages begin at around $6,800 per person, rising to more than $9,000 in the high season. Many hiking trails provide ideal routes for cross-country skiing, and many are groomed for that purpose. The largest concentration of groomed trails is in Kananaskis Country. Other areas are Banff, Jasper, Kootenay, Waterton, and Yoho National Parks. The Canmore Nordic Centre was developed for the 1988 Winter Olympic Games and is now a public facility. The town site in Waterton Lakes National Park all but closes down for winter, but this park is one of the most enjoyable spots for a skiing sojourn. Anywhere you can cross-country ski you can snowshoe, a traditional form of winter transportation that is making a comeback. Sleigh rides are offered in Banff, Lake Louise, and Jasper. Winter travel brings its own set of potential hazards, such as hypothermia, avalanche, frostbite, and sunburn. Necessary precautions should be taken. All park information centers can provide information on hazards and advise on current weather conditions.